CES at Frostburg State University announces an exciting 2018-19 season of professional performing arts events featuring artists from Greece, Ireland, Russia, Japan, Colombia, Argentina, Canada, South Africa and the United States. The season opens Saturday, Sept. 15, with Canadian folk musician Kaia Kater, who will present the Capstone Concert for FSU’s annual Appalachian Festival. Kater’s old-time banjo-picking prowess has been praised by traditional folk music lovers and critics. The 7:30 p.m. performance at the Frostburg Palace Theatre, 31 E. Main St., also features beloved folk duo Anna & Elizabeth, who bring traditional songs to life with plaintive vocal harmonies and atmospheric arrangements of guitar, banjo and fiddle. This engagement is supported by the Mid Atlantic Arts Foundation. Limited tickets are still available for multiple Grammy-winning musician LeAnn Rimes’ intimate, acoustic performance on Saturday, Sept. 22, at 7:30 p.m. in the Alice R. Manicur Assembly Hall of FSU’s Lane University Center. The youngest recipient of a Grammy Award, Rimes has sold more than 44 million albums and has won two Grammy Awards, three Academy of Country Music Awards and 12 Billboard Music Awards. With her latest album, “Remnants,” Rimes transports listeners to new heights with the magnificence of her powerful, soaring voice. This engagement is sponsored by Weimer Automotive Group. On Tuesday, Oct. 2, family audiences will be enchanted with “CATAPULT: The Amazing Magic of Shadow Dance.” These “America’s Got Talent” finalists use light, music and pure artistry to create captivating silhouettes that tell stories – all without uttering a single word. The 7:30 p.m. performance takes place in the Drama Theatre of FSU’s Woodward D. Pealer Performing Arts Center. The Maryland Symphony Orchestra, led by musical director Elizabeth Schulze, returns to Pealer Recital Hall with a program of luminous concerto, choral and orchestral works from Franz Schubert and Wolfgang Amadeus Mozart. The 2 p.m. performance on Sunday, Nov. 11, features guest performances from solo bassoonist Erick Heckscher and the FSU Chorale. This performance is sponsored by First Peoples Community Federal Credit Union and is supported by the Community Trust Foundation Iris and Peter Halmos Community Fund. The holiday season gets under way on Tuesday, Dec. 11, with Carol of the King – “The Irish Christmas Dance Spectacular.” Led by Justin Boros, former lead dancer from Michael Flatley’s “Lord of the Dance,” the artists perform lightning-fast hard-shoe rhythms and graceful soft-shoe jigs set to the heartwarming music of treasured Christmas melodies. The 7:30 p.m. performance takes place in the Pealer Drama Theatre. This event is co-sponsored by the Enordo “Moose” Arnone family and by an anonymous donor in recognition of the Western Maryland Health System Hospice Program. On Friday, Feb. 15, 2019, CES presents a romantic LIVE! at StarScape performance of René Marie and the jazz trio Experiment in Truth. A two-time Grammy-nominated jazz singer, Marie possesses a signature style rooted in the musical traditions of legends like Ella Fitzgerald, Sarah Vaughan and Dinah Washington. The 7:30 p.m. club-style performance takes place in Lane Manicur Hall. Patrons can also opt to attend a pre-show Valentine dinner at 6 p.m. This engagement is sponsored by Dr. and Mrs. Peter Halmos and is supported by the Mid Atlantic Arts Foundation. The Thursday, March 7, performance of “A Celtic Celebration” by Songs of Ireland offers universally loved songs and arias drawn from Irish folk, opera, the great American songbook and Broadway. The company features four tenors, four sopranos, a pianist and three traditional Irish instrumentalists on uilleann pipes, whistles, fiddle and concertina. The 7:30 p.m. performance in Pealer Recital Hall is sponsored by the Lewis J. Ort Library in observation of Irish-American Heritage Month. On Tuesday, March 12, the Russian National Ballet Theatre presents the haunting Romantic-era ballet “Giselle,” a tale of love, betrayal, forgiveness and redemption. A heartbroken peasant girl dies after discovering her lover is betrothed to another. When she is summoned from her grave by the vengeful female spirits who haunt the forest, she must fight to save her beloved from his fate. The performance, which takes place at 7:30 p.m. in the Pealer Drama Theatre, is sponsored by Dr. Julianne Ferris and Daniel F. McMullen Jr.
Banda Magda offers a high-spirited LIVE! At StarScape club-style performance on Friday, April 5, at 7:30 p.m. in Lane Manicur Hall. 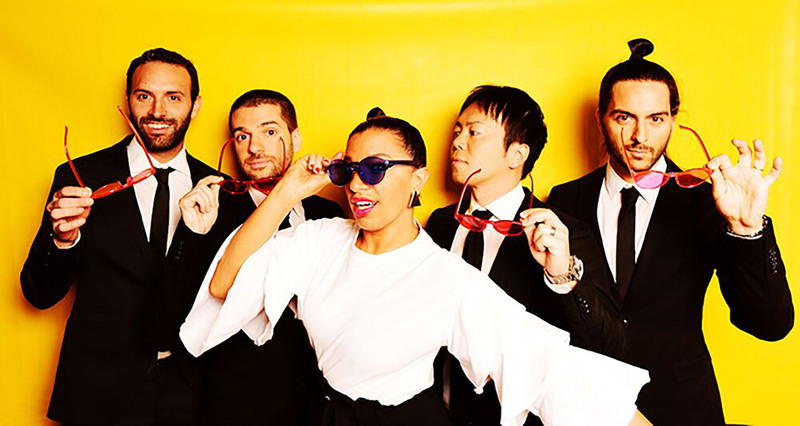 Led by Greek-born composer, singer and accordionist Magda Giannikou, Banda Magda’s musicians hail from around the world: Greece, Colombia, Venezuela, Japan and the United States. Their multilingual music inventively blends diverse international styles, resulting in an effervescent, eclectic evening of entertainment. This engagement is sponsored by Dr. and Mrs. Peter Halmos and is supported by the Mid Atlantic Arts Foundation Jazz Touring Network. On Thursday, April 25, at 7:30 p.m., the Christian Sands Trio closes the season with a LIVE! at StarScape club-style performance in Lane Manicur Hall. Sands, a five-time Grammy Award-nominated jazz pianist, delivers an innovative look at the entire language of jazz: stride, swing, bebop, progressive, fusion, Brazilian and Afro-Cuban. This engagement is supported by the Mid Atlantic Arts Foundation Jazz Touring Network. Season tickets, including packages and discounts, are available beginning Monday, Aug. 27. For more information, visit CES’ webpage at ces.frostburg.edu or contact the CES box office at 1-866-849-9237 or 301-687-3137. The CES box office, located in the Lane Center, is open Monday through Friday from 10 a.m. to 4 p.m. The Cultural Events Series is supported in part by a grant from the Maryland State Arts Council. On the web at msac.org. CES is sponsored in part by the City of Frostburg.